Babes With Blades Theatre Company starts its 21st Season with the world premiere of THE LADY DEMANDS SATISFACTION. 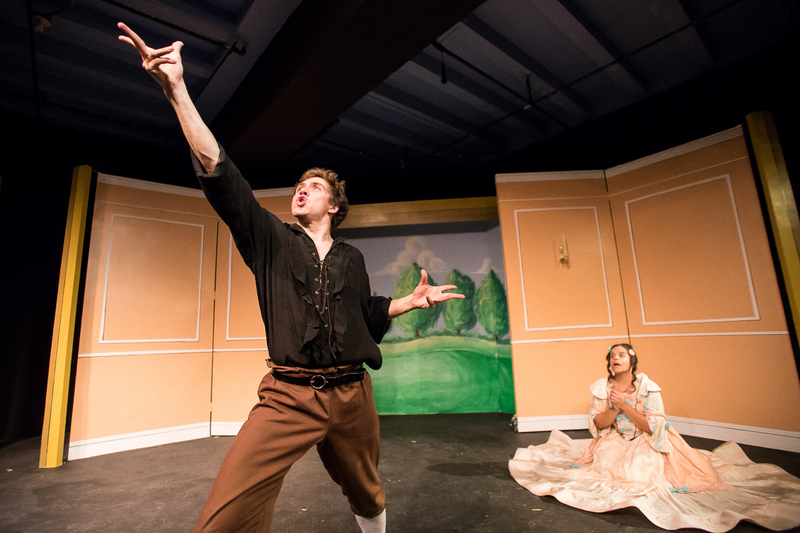 Playwright Arthur M. Jolly pens a fun farce. His story follows Trothe’s (played by the delightfully obtuse Deanalis Resto) quest to secure her inheritance. Jolly uses forbidden love, mistaken identities and witty dialogue to captivate the audience. Under the skillful direction of Morgan Manasa, this terrific ensemble commits hard! They tirelessly banter, cavort and fight (Violence Designer Samantha Kaufman). Each utterance or movement works to elevate the humor. The cast gets Jolly and it shows! 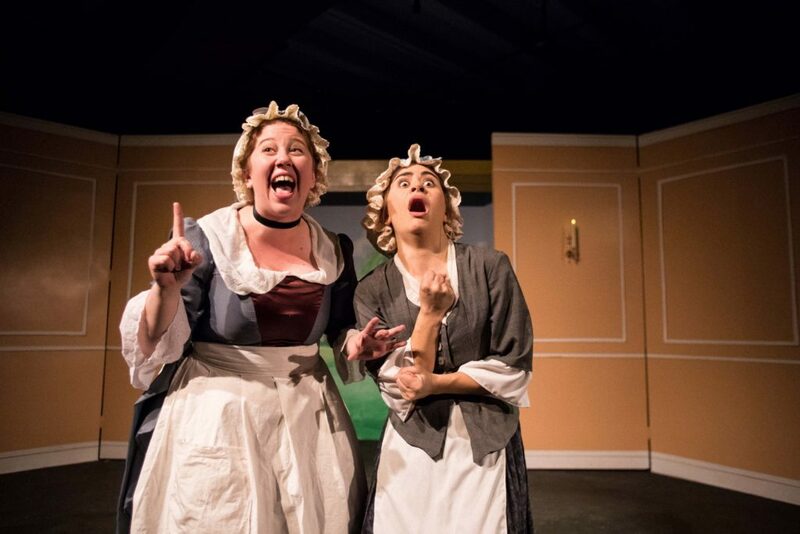 Kate Booth (Penelope) and Ari Kraiman (Tilly) play the clever and loyal maids. They are willing to protect Trothe at all costs. The steadfast Booth is the master manipulator that forces the often put-upon Kraiman into impersonating a Prussian. Their scam gets even funnier when the real Prussian (played by the gallant Amanda Forman) comes to dinner. As Kraiman hilariously fakes her way through the foreign language, Forman is treated like an unwelcome servant. Bringing the lusty buffoonery, Resto and Felipe Carrasco (Osric) are the star-crossed lovers. Resto is totally smitten with Carrasco spewing poetic lunacy. Their passion is palpable and laughable. At one point, Carrasco begs for Resto’s handkerchief. She gives it to him. He seductively and crazily puts it in his mouth. He then pulls it out and gives it back to Resto. She instantly puts it in her mouth. It’s foreplay without the kissing. And it’s a riot! 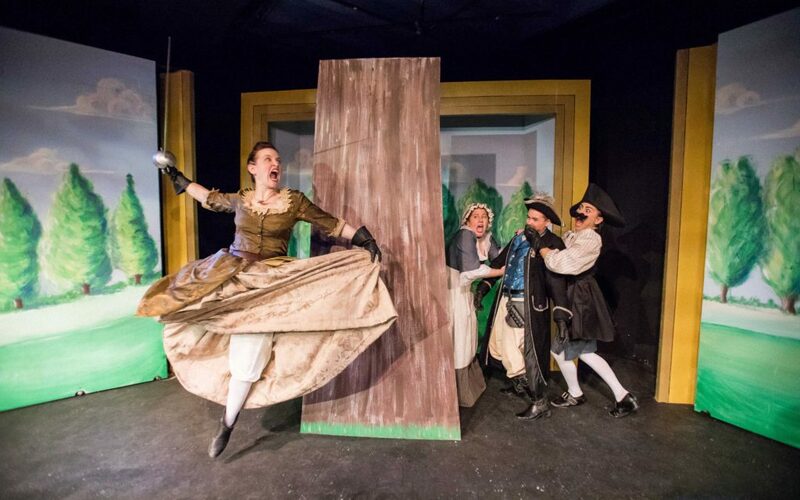 Although the entire cast deliver the madcap mirth, Megan Schemmel (Theodosia) steals the show. Schemmel is outstanding and hysterical playing Trothe’s aunt and a famed swordswoman. Schemmel takes on an affected aristocratic diction and posture. She kills intruders and dismisses maids with the same aloofness. She brandish her sword and her comedy delivery with the same razor-sharp precision. Schemmel slays! This isn’t a heavy, serious show. It’s a Jolly farce! In the mood for a summer escape in the city? THE LADY DEMANDS SATISFACTION is your frothy frolic destination. At City Lit Theater, 1020 W. Bryn Mawr Ave. Combat by Violence Designer Samantha Kaufman. Additional information and tickets are available now at BabesWithBlades.org.